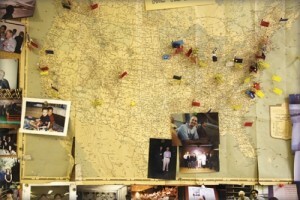 This article was originally published in Endeavors in 2008. 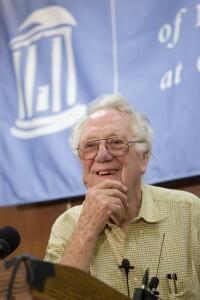 Dr. Oliver Smithies smiles as he takes questions at a press conference at The University of North Carolina at Chapel Hill about his winning the Nobel Prize in medicine. Early in the morning on October 8, Oliver Smithies got the call. Carolina’s first Nobel Prize winner had spent half a century doing the science he loves. In 1936, when Oliver Smithies was eleven years old, his uncle lent him a telescope with a broken lens. Oliver wanted to fix it, so he read stacks of Scientific American magazines at the local library. Days of work down the drain. But Smithies shook it off and tried to make a smaller lens with the remnants of the first. He sprinkled grinding powder on a thick slab of mirrored glass and used a metal soup can attached to a drill press to cut the glass down to size. He wasn’t sure the edge of the soup can was sharp enough to cut the mirror, but he tried anyway. For hours, Smithies withstood the piercing screech of metal boring into glass, turning that drill handle and watching the soup can rotate slowly until it finally cut through. “And I did make that lens,” he says. “But I could never get that telescope to work.” Smithies, though, realized that he loved the process more than anything. He loved making things. And he did eventually make a telescope, along with a bunch of other cool stuff. As an adult, he was still tinkering and inventing. By age sixty, in 1985, Smithies had garnered several awards for various discoveries and inventions, and was still working at his lab bench every day. But at that time, Smithies was in the throes of a complex series of experiments, well beyond telescopes and pulverized glass and so tediously long that graduate students left to pursue other goals. Many scientists doubted his hypothesis. Could Smithies actually insert a segment of DNA into the gene of a mammalian cell, and prove that the DNA segment took up residency at the proper location in the cell’s genetic material? Smithies thought he would have quite an invention on his hands — a way to target specific genes so that, potentially, mutated genes could be replaced or repaired. The method took years. It was cumbersome and unwieldy, but he got it to work. He successfully targeted a specific gene. Around the same time and independently of Smithies, geneticist Mario Capecchi also figured out gene targeting. And in England, Martin Evans had successfully isolated the embryonic stem cells in a mouse, altered the genes of those cells, and reintroduced the cells into a foster mouse to create genetically modified offspring. Photo by Mark Derewicz, ©2008 Endeavors Tiny flags on a map outside Smithies’ office show where some of his former graduate students work. Biomedical research has never been the same. Using the discoveries of these three scientists, researchers around the world, including Smithies, created hundreds of mouse strains that genetically model human diseases. They also made thousands of mouse models that have altered genetic material so scientists can figure out what specific genes are responsible for doing. “There is no doubt that this work will lead to new therapies in virtually every disease that has a genetic basis,” says Etta Pisano, vice dean of UNC’s School of Medicine and professor of radiology and biomedical engineering. Mouse models have opened up countless avenues of research, created a vast amount of scientific knowledge, and led to the creation of drugs for cancer and other diseases. For this, Smithies, Capecchi, and Evans won the 2007 Nobel Prize for Physiology or Medicine. Photo courtesy of Oliver Smithies, ©2008 Endeavors. 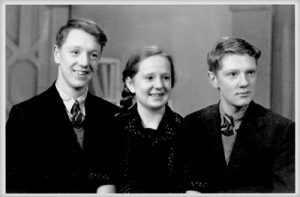 Oliver Smithies, left, as a teenager in England with his younger sister Nancy and fraternal twin brother Roger. The son of an English teacher and an insurance salesman, Smithies grew up in Copley, a small industrial village two hundred miles north of London. It was a happy childhood spent with his fraternal twin brother and younger sister. But in 1932 Smithies contracted rheumatic fever, which can cause damage to the heart. He was bedridden for ten weeks and wasn’t allowed to play sports until he was fourteen. While Smithies was reading, a character in a comic book — an inventor — caught his eye. Already fond of tinkering in his father’s garage, Smithies announced to his family that he would become an inventor. As luck or fate would have it, his best friend’s dad managed a clock-making company. 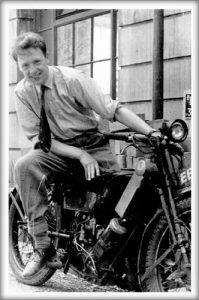 Oliver Smithies in his early twenties, sitting on a motorcycle that he continually tinkered with. At the time of this photo, he was a university student at Oxford. Smithies made radios and telescopes, and tried to make a remote speaker system out of a pig’s bladder, learning the scientist’s credo early in life: “If you need something that’s not available, you make it.” In his lab is equipment he made twenty years ago. He nods toward a polymerase chain reaction machine, which isolates different parts of the DNA sequence from genetic material. “When it was invented, you couldn’t buy one right away, so I made one,” he says. At Oxford Smithies considered becoming a physicist, but then thought he’d be able to help more people in a direct way if he studied medicine. After two years of medical school he was given a choice between clinical work and extra schooling for an honors degree. He chose the latter and studied animal physiology. During that honors year, his favorite teacher was Sandy Ogston, a molecular biologist at a time when molecular biology didn’t exist as a formal topic. Under Ogston’s tutelage, Smithies figured out a way to detect interactions between proteins by measuring osmotic pressures. The experiments took more than two years, and although they were ultimately successful, nobody ever used his method. He would later say that his discovery was useless, but he considered the work good training. And he felt satisfied. Smithies earned his doctorate, and then Ogston advised him to work abroad, maybe in the United States. 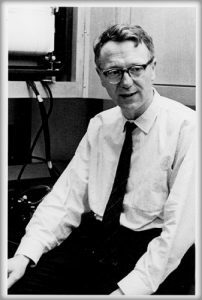 Smithies did his post-doctoral work at the University of Wisconsin before heading to Connaught Medical Research Laboratory in Toronto, where he worked from 1952 to 1960. Scientists there had two main duties: make compounds not readily available in Canada and do research. Smithies worked with insulin; he suspected that there was a precursor to the hormone. To find out, he had to separate proteins in blood, and for that he chose a method called electrophoresis. The experiment went like this: you put a spot of protein mixture in one place on a wet piece of filter paper and then pass an electric current through the paper. Proteins that were negatively charged would move toward the positive end of the paper. Vice-versa for positively charged proteins. This way, the proteins would separate. “But I noticed that insulin stuck to the paper,” Smithies says. “It didn’t really move; it just unrolled like a carpet, and then it stopped.” He couldn’t figure out anything about insulin this way. That meant doing fifty protein determinations for one experiment. It worked. The proteins separated, the dye stained them, and Smithies studied them. Before this, scientists thought that a molecule of blood contained five different proteins. Smithies found twenty-five, and also determined that all of us have very different mixtures of proteins in our blood. Scientists everywhere began looking for genetic differences in blood and finding them, opening up a whole new realm of biological understanding and leading to the use of blood proteins in forensic science. Scientists eventually found several hundred different proteins in blood. His invention, gel electrophoresis, turned out to be a much more powerful method for separating proteins than typical starch electrophoresis. Gel electrophoresis is the father of acrylamide gel electrophoresis, which labs everywhere still use today. For this work, Smithies won the Gairdner Foundation International Award, considered a precursor for the Nobel. More importantly, his experiments piqued his interest in genetic differences. Around the same time, Francis Crick and James Watson discovered the structure of DNA. Smithies became a geneticist. Smithies at the University of Wisconsin, where he delved into genetics research from 1960 to 1987 before coming to Carolina. It was at Wisconsin that he developed the initial method for gene targeting that led to mice that model hundreds of human diseases. In 1960 Smithies returned to the University of Wisconsin, where he discovered that some people have duplicates of parts of certain genes: they have two copies of a given gene instead of just one. He also found that these partially duplicated genes can match up on the chromosome in two different ways, in some cases leading to the creation of a gene that is three times the normal length. As genetic science advanced through the 1970s, Smithies began studying individual hemoglobin genes. Up until that point, scientists worked with hemoglobin proteins. Vernon Ingram, for instance, discovered the particular amino acid that causes sickle cell anemia. Then scientists discovered the lone gene implicated in the disease. Meanwhile, Smithies was one of the first scientists to physically separate a gene from the rest of the DNA of the human genome, a process referred to as isolating a gene. His lab then isolated the normal DNA that corresponds to the hemoglobin gene that is mutated in sickle cell patients. “So I thought surely it should be possible to use the normal DNA to correct the abnormal DNA,” Smithies says. He thought this could lead to cures for diseases in which one gene is implicated. Then in 1982 Smithies read a paper about a complex method for finding one piece of DNA among hundreds of thousands of pieces. He wondered if he could use a similar procedure to find out if a foreign piece of DNA that he inserted into a cell could find the corresponding spot in that cell’s genome, and then replace that gene. If this could work — this gene targeting — then theoretically scientists could correct faulty genes. “So I thought about that paper and taught about it — I was teaching a graduate class at the time — and then ten days later I realized how to do the experiment,” he says. It took three years, but toward the end he found some evidence that DNA injected into cell culture did find the right spot in the cells’ DNA through a process called homologous recombination. But he still needed definite proof of success or failure. Smithies was trying to show that beta-globin genes and hemoglobin genes with eleven thousand base pairs were altered. If so, they’d have only seven thousand bases. Smithies says that his eureka moment felt like coming out of the clouds while flying a plane, a hobby he picked up in the 1970s. Smithies had landed, but the ride was a little rocky. His method was complicated. Until then, gene targeting had only been achieved in yeast. Many researchers were skeptical of targeting human genes because human genes and cells are much more complex than yeast. Smithies forged ahead along with a few other optimists, including Mario Capecchi, who Smithies says devised a more efficient method for gene targeting that allowed scientists to see what certain genes are responsible for. Then Smithies attended a conference in Scotland where Martin Evans showed how he had removed embryonic stem cells from a mouse, altered the genes, and inserted the stem cells into a different mouse. That mouse’s offspring had the same genetic alteration, and the implications were enormous. Smithies wanted those embryonic stem cells. He spoke with Evans, who later delivered some to Smithies in a vial in his shirt pocket. Smithies and Capecchi, still working independently but now in closer contact, grew the stem cells in their labs, studied how they evolve, and later created mouse models that show precisely how genes function and how gene mutations can cause human diseases. They won the Gairdner Award for their work in gene targeting; it was the second time Smithies won. In 2001, Smithies, Capecchi, and Evans won the Lasker Award, considered the American version of the Nobel Prize. Nearly 50 percent of Lasker winners go on to win the Nobel, and Carolina was abuzz with the possibility that Smithies would soon fall in that category. Smithies says that the science behind gene targeting is difficult to explain. So he likes to use a pair of analogies. Imagine a book with one thousand pages, each page containing one thousand words. Now imagine three thousand of these books. All those words represent all the genetic information in a human body. Gene targeting allows scientists to pinpoint one word on page ninety-one in volume 1,349. The procedure allows scientists to knock out that word or replace it. That’s how genes work. Some don’t do much, if anything. Others are responsible for quite a lot. Sometimes, if just one gene is mutated, you can get a disease such as cystic fibrosis, sickle-cell anemia, or Lesch-Nyhan Syndrome, a rare disease that causes sufferers to severely mutilate themselves. In Smithies’ lab, geneticist Nobuyo Maeda managed to correct that Lesch-Nyhan gene in cell culture. Two years later at UNC, Smithies and geneticist Beverly Koller created the first mouse model of Lesch-Nyhan Syndrome. And in 1992, Smithies and Koller made the first mouse model of cystic fibrosis. Meanwhile, hundreds of other scientists began using this new gene-targeting tool. Before gene targeting, Berg says that it was difficult to prove which mutated genes caused certain diseases. But then along came the knockout mouse. NIGMS has granted nearly twenty million dollars to Capecchi and Smithies since 1968 and 1973, respectively. And their work, Berg says, has dramatically increased our knowledge of biology, genetics, and human diseases. It’s inspired new lines of basic research and has led to the creation of drugs, such as the cancer drug Imatinib. Tens of thousands of jobs — many of them in North Carolina — have been created as part of the multi-billion-dollar biotech industry that’s built on basic research such as the original work of Smithies and Capecchi. In 1987 Smithies finished his twenty-seventh year at the University of Wisconsin. He was sixty-two, and he and Nobuyo Maeda fell in love. The next year, Wisconsin failed to offer a job to Maeda. UNC hired her and Smithies followed her to Chapel Hill; a $900,000 grant from the North Carolina Biotechnology Center helped bring them both here, along with five other promising scientists. Photo by Dan Sears, ©2008 Endeavors. 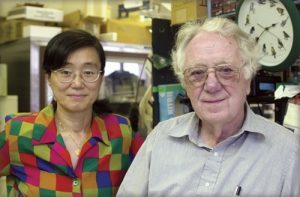 In 1988 Nobuyo Maeda and Oliver Smithies left Wisconsin and settled into their lab in UNC’s Brinkhous-Bullitt building, where Maeda created the first mouse models of atherosclerosis and Smithies tackled the complex genetic causes of high blood pressure. They also married. Smithies and Maeda were soon married, and moved into a house not far from campus. They also moved their labs into the seventh floor of UNC’s Brinkhous-Bullitt building, where they still work today. Inspired by his wife’s research on the genetic causes of atherosclerosis (she created the first mouse model of the complex disease), Smithies began studying the equally complex genetics of hypertension. By the year 2000, forty-some graduate students had worked in the Smithies-Maeda lab. Josh Knowles was one of them. Knowles, now a research fellow at Stanford, was in Chapel Hill for a wedding last October when the announcement came that Smithies had won the Nobel Prize. Knowles remembers Smithies saying that young scientists should try to find something they love so much that they’d sacrifice a weekend for it. Smithies still follows this advice, often working seven days a week. And still, at 82, he conducts experiments himself, an uncommon thing for an accomplished scientist of any age. Smithies is also fond of saying that scientists should have three things in life: their work, a hobby, and a family. His family is Nobuyo. His hobby is flying. And his work continues. He is currently researching how kidneys separate large and small molecules. One sunny Sunday last October, Smithies spent several hours in his lab — not at the bench, but at the desk. He was working on a grant proposal. “I was doing something most scientists will recognize,” he says. “I was writing a reply to a committee that turned down my request for funding.” Later that day, he and Maeda enjoyed lunch together. And then he took his plane for spin above Chapel Hill. It was a really good day, he says. At five o’clock the next morning, his phone rang. It was the Nobel Foundation. A peaceful feeling came over him. This article was written by Mark Derewicz and originally published in Endeavors on January 1, 2008.